Have yourself lookin stylish while feeling comfy with the UGG® Ansley Pendleton. This snuggly women’s slipper features a water-resistant suede with comfy wool lining. Stitched detail, an embroidered vamp and rubber sole lends indoor and outdoor versatility. Getting cozy just got a lot more fashionable with the Dakota Flora Perf slipper by UGG®. Water-resistant suede upper with fun perf details and a satin bow for added appeal. Easy slip-on style. Metallic canvas underlay. UGGpure™ wool lining for added warmth and comfort. Durable rubber outsole. 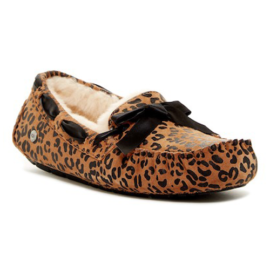 A fan-favorite moccasin slipper from UGG Australia gets updated in a lively leopard print and tied with a neat bow. The soft, cozy lining is made from genuine shearling or plush UGGpure, a textile made entirely from wool but crafted to feel and wear like genuine shearling. Either version keeps feet warm and comfortable, whatever the weather.